This is “Government and Fiscal Policy”, chapter 12 from the book Macroeconomics Principles (v. 2.0). For details on it (including licensing), click here. Shaken by the severity of both the recession that began in December 2007 and the financial crisis that occurred in the fall of 2008, Congress passed a huge $784 billion stimulus package in February 2009. President Obama described the measure as only “the beginning” of what the federal government ultimately would do to right the economy. Over a quarter of the American Recovery and Reinvestment Act (ARRA) was for a variety of temporary tax rebates and credits for individuals and firms. For example, each worker making less than $75,000 a year received $400 ($800 for a working couple earning up to $150,000) as a kind of rebate for payroll taxes. That works out to $8 a week. Qualifying college students became eligible for $2,500 tax credits for educational expenses. During a certain period, a first-time homebuyer was eligible for a tax credit. The other roughly three-quarters of the ARRA were for a variety of government spending programs, including temporary transfers to state and local governments, extended unemployment insurance and other transfers to people (such as food stamps), and increased infrastructure spending. The president said that the measure would “ignite spending by businesses and consumers … and make the investment necessary for lasting growth and economic prosperity.”Barack Obama, Weekly Address of the President to the Nation, February 14, 2009, available at http://www.whitehouse.gov/blog/09/02/14/A-major-milestone/. Shortly after the passage of the ARRA, Congress passed the Cash for Clunkers program, which for a limited period of time allowed car buyers to trade in less-fuel-efficient cars for rebates of up to $4,500 toward buying new cars that met certain higher fuel-efficiency standards. The ARRA illustrates an important difficulty of using fiscal policy in an effort to stabilize economic activity. It was passed over a year after the recession began. Only about 20% of the spending called for by the legislation took place in 2009, rising to about two-thirds through the middle of 2010. It was a guess what state the economy would be in then. As it turned out, the recession had officially ended, but there was still a large recessionary gap, and unemployment was still a major concern. There was a great deal of media controversy about how effective the policy had been and whether the resulting increase in national debt was worth it. Concern over the expanded size of the federal government created by the stimulus measures became a rallying cry for the Tea Party movement. A fiscal stimulus package of over $150 billion had already been tried earlier in February 2008 under President George W. Bush. It included $100 billion in temporary tax rebates to households—up to $600 for individuals and $1,200 for couples—and over $50 billion in tax breaks for businesses. The boost to aggregate demand seemed slight—consumers saved much of their rebate money. In November 2008, unemployment insurance benefits were extended for seven additional weeks, in recognition of the growing unemployment problem. President Obama argued that his proposals for dealing with the economy in the short term would, coincidentally, also promote long-term economic health. Some critics argued for a greater focus on actual tax cuts while others were concerned about whether the spending would focus on getting the greatest employment increase or be driven by political considerations. How do government tax and expenditure policies affect real GDP and the price level? Why do economists differ so sharply in assessing the likely impact of such policies? Can fiscal policy be used to stabilize the economy in the short run? What are the long-run effects of government spending and taxing? We begin with a look at the government’s budget to see how it spends the tax revenue it collects. Clearly, the government’s budget is not always in balance, so we will also look at government deficits and debt. We will then look at how fiscal policy works to stabilize the economy, distinguishing between built-in stabilization methods and discretionary measures. We will end the chapter with a discussion of why fiscal policy is so controversial. As in the previous chapter on monetary policy, our primary focus will be U.S. policy. However, the tools available to governments around the world are quite similar, as are the issues surrounding the use of fiscal policy. Understand the major components of U.S. government spending and sources of government revenues. Define the terms budget surplus, budget deficit, balanced budget, and national debt, and discuss their trends over time in the United States. We begin our analysis of fiscal policy with an examination of government purchases, transfer payments, and taxes in the U.S. economy. The government-purchases component of aggregate demand includes all purchases by government agencies of goods and services produced by firms, as well as direct production by government agencies themselves. When the federal government buys staples and staplers, the transaction is part of government purchases. The production of educational and research services by public colleges and universities is also counted in the government-purchases component of GDP. While government spending has grown over time, government purchases as a share of GDP declined from over 20% until the early 1990s to under 18% in 2001. Since then, though, the percentage of government purchases in GDP began to increase back toward 20% and then beyond. This first occurred as military spending picked up, and then, more recently, it rose even further during the 2007–2009 recession. 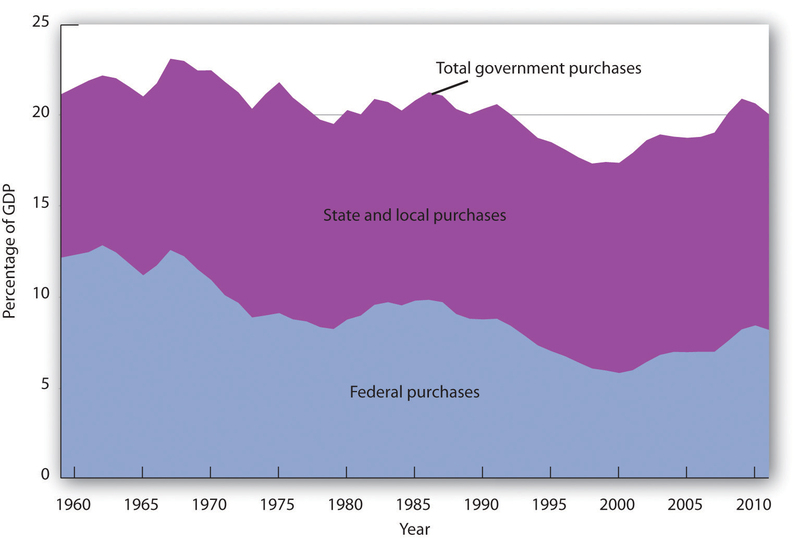 Figure 12.1 "Federal, State, and Local Purchases Relative to GDP, 1960–2011" shows federal as well as state and local government purchases as a percentage of GDP from 1960 to 2011. Notice the changes that have occurred over this period. In 1960, the federal government accounted for the majority share of total purchases. Since then, however, federal purchases have fallen by almost half relative to GDP, while state and local purchases relative to GDP have risen. Government purchases were generally above 20% of GDP from 1960 until the early 1990s and then below 20% of GDP until the 2007-2009 recession. The share of government purchases in GDP began rising in the 21st century. Source: Bureau of Economic Analysis, NIPA Table 1.1 and 3.1 (revised February 29, 2012). A transfer paymentThe provision of aid or money to an individual who is not required to provide anything in exchange. 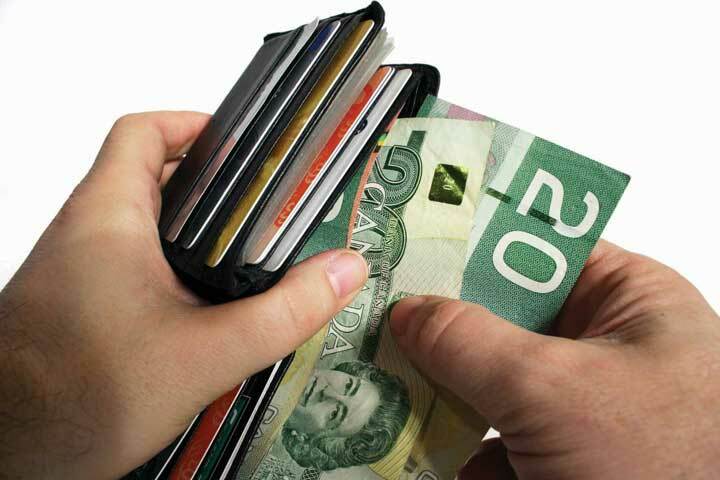 is the provision of aid or money to an individual who is not required to provide anything in exchange for the payment. 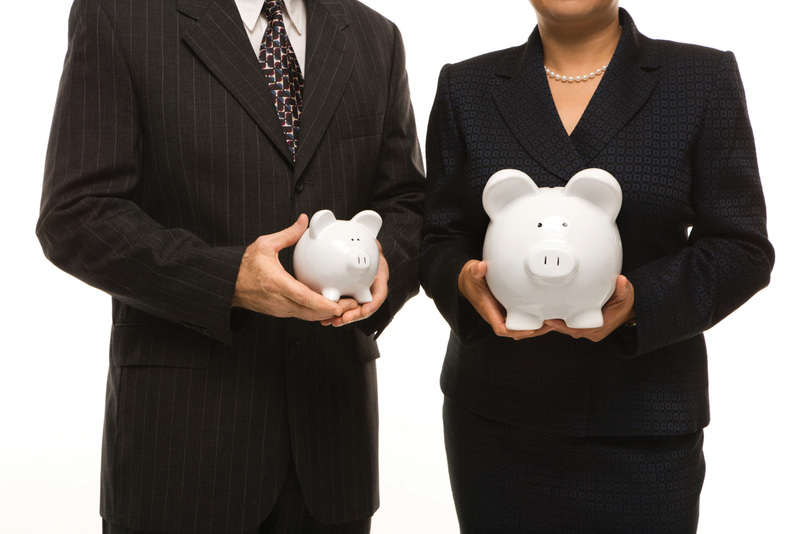 Social Security and welfare benefits are examples of transfer payments. During the 2007-2009 recession, transfers rose. A number of changes have influenced transfer payments over the past several decades. First, they increased rapidly during the late 1960s and early 1970s. This was the period in which federal programs such as Medicare (health insurance for the elderly) and Medicaid (health insurance for the poor) were created and other programs were expanded. Figure 12.2 "Federal, State, and Local Transfer Payments as a Percentage of GDP, 1960–2011" shows that transfer payment spending by the federal government and by state and local governments has risen as a percentage of GDP. In 1960, such spending totaled about 6% of GDP; by 2009, it had risen to about 18%. The federal government accounts for the bulk of transfer payment spending in the United States. 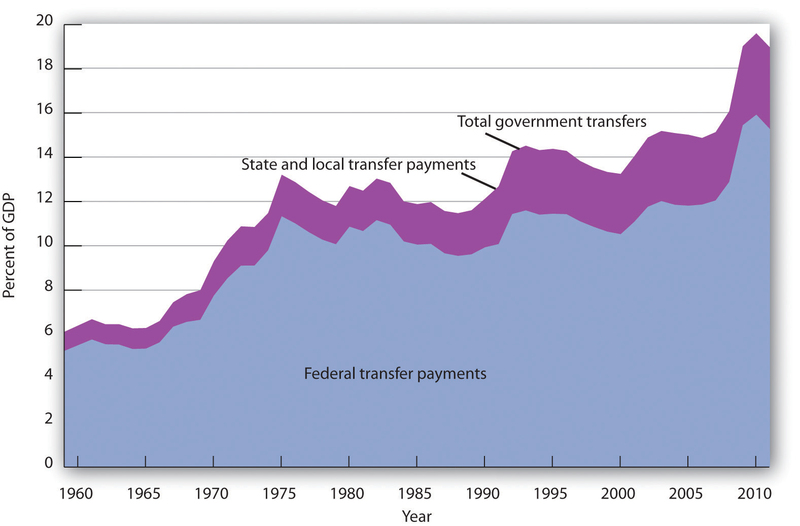 The chart shows transfer payment spending as a percentage of GDP from 1960 through 2011. This spending rose dramatically relative to GDP during the late 1960s and the 1970s as federal programs expanded. More recently, sharp increases in health-care costs have driven upward the spending for transfer payment programs such as Medicare and Medicaid. Transfer payments fluctuate with the business cycle, rising in times of recession and falling during times of expansion. As such, they rose sharply during the deep 2007-2009 recession. Source: Bureau of Economic Analysis, NIPA Table 1.1, 3.2, and 3.3 (revised February 29, 2012). Transfer payment spending relative to GDP tends to fluctuate with the business cycle. Transfer payments fell during the late 1970s, a period of expansion, then rose as the economy slipped into a recessionary gap during the 1979–1982 period. Transfer payments fell during the expansion that began late in 1982, then began rising in 1989 as the expansion began to slow. Transfer payments continued to rise relative to GDP during the recessions of 1990–1991 and 2001–2002 and then fell as the economy entered expansionary phases after each of those recessions. During the 2007—2009 recession, transfer payments rose again. When economic activity falls, incomes fall, people lose jobs, and more people qualify for aid. People qualify to receive welfare benefits, such as cash, food stamps, or Medicaid, only if their income falls below a certain level. They qualify for unemployment compensation by losing their jobs. More people qualify for transfer payments during recessions. When the economy expands, incomes and employment rise, and fewer people qualify for welfare or unemployment benefits. Spending for those programs therefore tends to fall during an expansion. 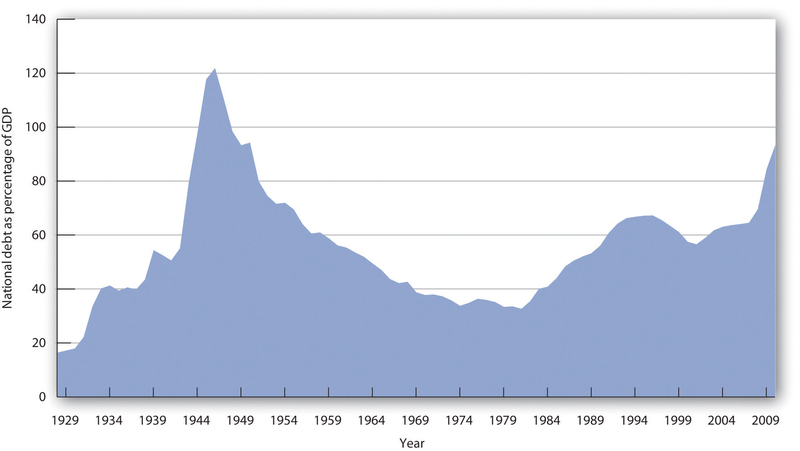 Figure 12.3 "Government Spending as a Percentage of GDP, 1960–2011" summarizes trends in government spending since 1960. It shows three categories of government spending relative to GDP: government purchases, transfer payments, and net interest. Net interest includes payments of interest by governments at all levels on money borrowed, less interest earned on saving. 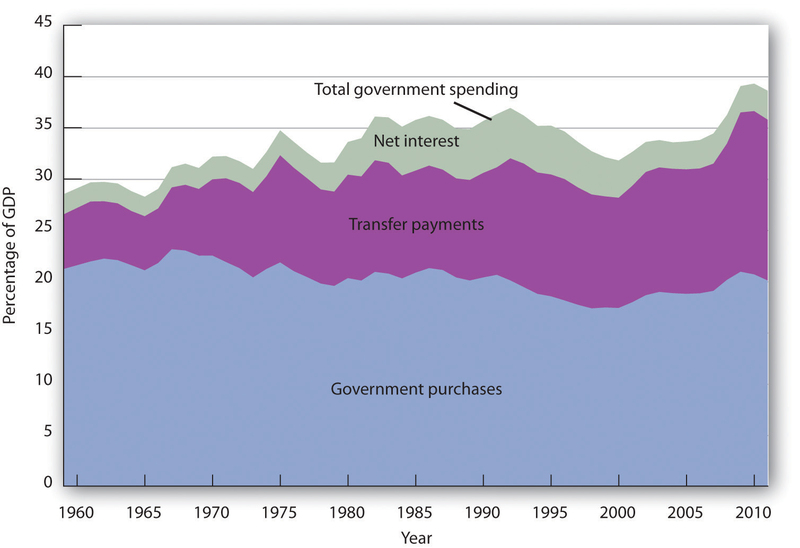 This chart shows three major categories of government spending as percentages of GDP: government purchases, transfer payments, and net interest. Taxes affect the relationship between real GDP and personal disposable income; they therefore affect consumption. They also influence investment decisions. Taxes imposed on firms affect the profitability of investment decisions and therefore affect the levels of investment firms will choose. Payroll taxes imposed on firms affect the costs of hiring workers; they therefore have an impact on employment and on the real wages earned by workers. The bulk of federal receipts come from the personal income tax and from payroll taxes. State and local tax receipts are dominated by property taxes and sales taxes. The federal government, as well as state and local governments, also collects taxes imposed on business firms, such as taxes on corporate profits. 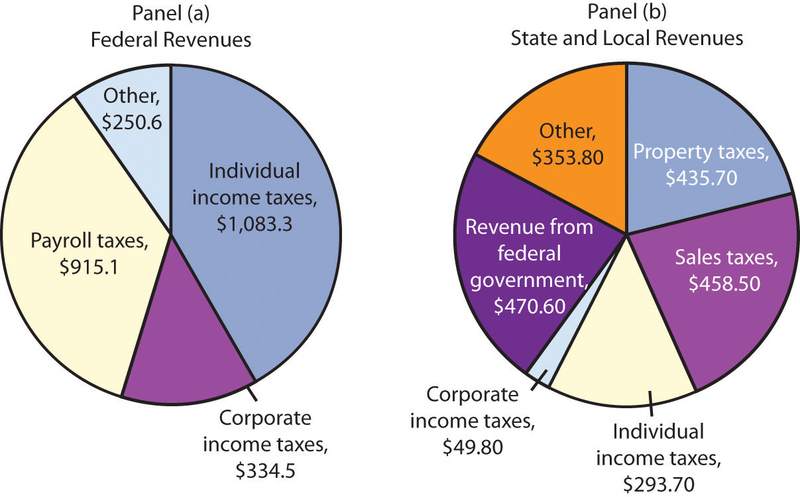 Figure 12.4 "The Composition of Federal, State, and Local Revenues" shows the composition of federal, state, and local receipts in a recent year. Federal receipts come primarily from payroll taxes and from personal taxes such as the personal income tax. State and local tax receipts come from a variety of sources; the most important are property taxes, sales taxes, income taxes, and grants from the federal government. Data are for third-quarter 2011, in billions of dollars, seasonally adjusted at annual rates. Source: Bureau of Economic Analysis, NIPA Table 3.2 and 3.3 (revised February 29, 2012). The government’s budget balance is the difference between the government’s revenues and its expenditures. A budget surplusSituation that occurs if government revenues exceed expenditures. occurs if government revenues exceed expenditures. A budget deficitSituation that occurs if government expenditures exceed revenues. occurs if government expenditures exceed revenues. The minus sign is often omitted when reporting a deficit. If the budget surplus equals zero, we say the government has a balanced budgetSituation that occurs if the budget surplus equals zero.. 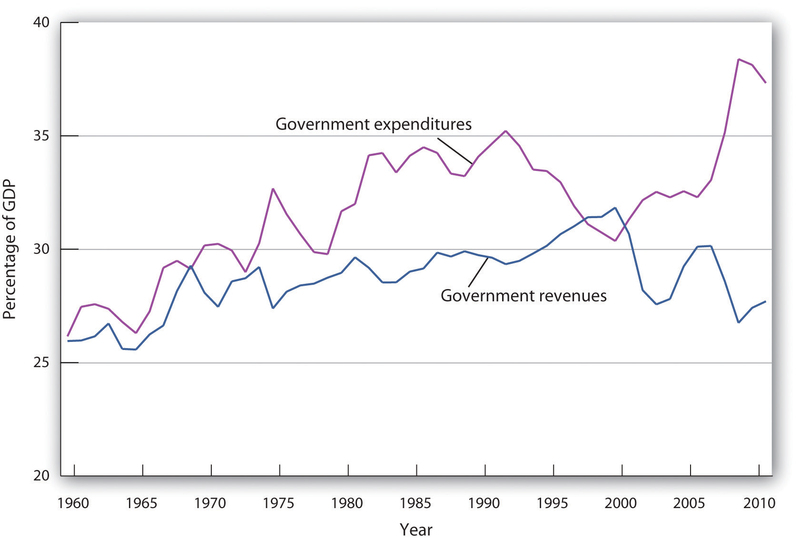 Figure 12.5 "Government Revenue and Expenditure as a Percentage of GDP, 1960–2011" compares federal, state, and local government revenues to expenditures relative to GDP since 1960. The government’s budget was generally in surplus in the 1960s, then mostly in deficit since, except for a brief period between 1998 and 2001. Bear in mind that these data are for all levels of government. The government’s budget was generally in surplus in the 1960s, then mostly in deficit since, except for a brief period between 1998 and 2001. The administration of George W. Bush saw a large increase in the federal deficit. In part, this was the result of the government’s response to the terrorist attacks in 2001. It also results, however, from large increases in federal spending at all levels together with tax cuts in 2001, 2002, and 2003. The federal deficit grew even larger during the administration of Barack Obama. The increase stemmed from both reduced revenues and increased spending resulting from the recession that began in 2007 and the stimulus. The national debtThe sum of all past federal deficits, minus any surpluses. is the sum of all past federal deficits, minus any surpluses. Figure 12.6 "The National Debt and the Economy, 1929–2010" shows the national debt as a percentage of GDP. It suggests that, relative to the level of economic activity, the debt is well below the levels reached during World War II. The ratio of debt to GDP rose from 1981 to 1996 and fell in the last years of the 20th century; it began rising again in 2002 and has risen substantially since the recession that began in 2007. The national debt relative to GDP is much smaller today than it was during World War II. The ratio of debt to GDP rose from 1981 to 1996 and fell in the last years of the 20th century; it began rising again in 2002, markedly so in 2009 and 2010. Sources: Data for 1929–1938 from Historical Statistics of the United States, Colonial Times to 1957—not strictly comparable with later data. Data for remaining years from Office of Management and Budget, Budget of the United States Government, Fiscal Year 2012, Historical Tables. Judged by international standards, the U.S. national debt relative to its GDP is above average. 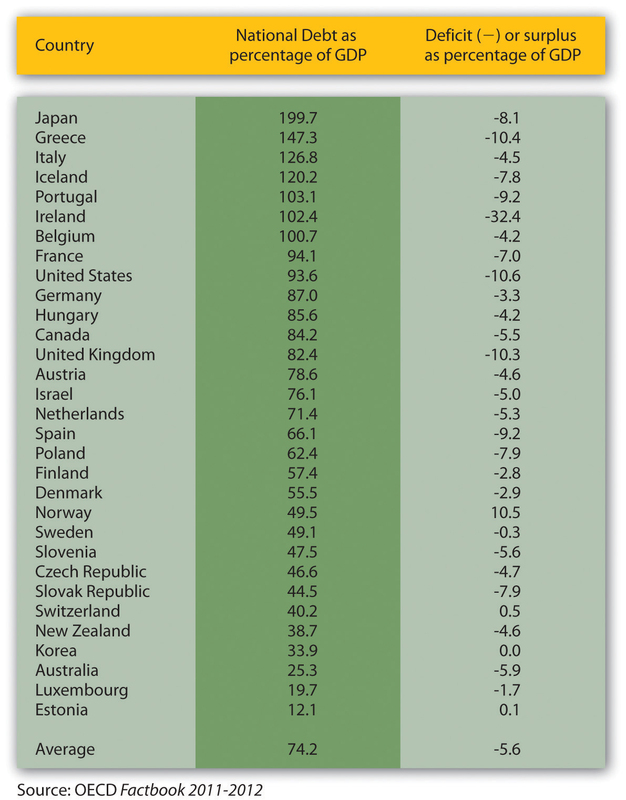 Figure 12.7 "Debts and Deficits for 32 Nations, 2010" shows national debt as a percentage of GDP for 32 countries in 2010. It also shows deficits or surpluses as a percentage of GDP. In an intense struggle between the Republican-majority U.S. House of Representatives and the Obama administration and the Democratic-majority U.S. Senate in the summer of 2011 that almost resulted in a government shutdown, the Budget Control Act of 2011 resulted in a $1 trillion deficit reduction for the current fiscal year with additional reductions of $1.2–1.5 trillion scheduled to follow. The one thing that all politicians seem to agree on is that this measure will not be enough to put the U.S. government deficit and debt back onto a sustainable long-term path. The various factions differ on what mix of spending cuts and tax increases should be used to control the deficit and debt over the long term. They also disagree on when these changes should take place, given the still-fragile state of the U.S. economy in 2012. The chart shows national debt as a percentage of GDP and deficits or surpluses as a percentage of GDP in 2010. The national debt of the United States relative to its GDP was above average among these nations. Source: Organisation for Economic Co-operation and Development (OECD). Factbook 2011–2012: Economic, Environmental and Social Statistics. OECD Publishing, 2011. Over the last 50 years, government purchases fell from about 20% of U.S. GDP to below 20%, but have been rising over the last decade. Transfer payment spending has risen sharply, both in absolute terms and as a percentage of real GDP since 1960. The bulk of federal revenues comes from income and payroll taxes. State and local revenues consist primarily of sales and property taxes. The government budget balance is the difference between government revenues and government expenditures. 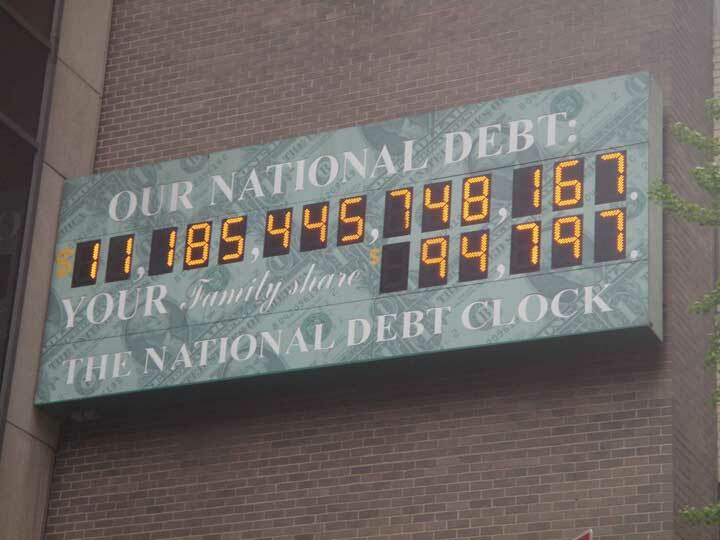 The national debt is the sum of all past federal deficits minus any surpluses. What happens to the national debt when there is a budget surplus? What happens to it when there is a budget deficit? What happens to the national debt if there is a decrease in a surplus? What happens to it if the deficit falls? One method of assessing the degree to which current fiscal policies affect future generations is through a device introduced in the early 1990s called generational accounting. It measures the impact of current fiscal policies on different generations in the economy, including future generations. Generational accounting is now practiced by governments in many countries, including the United States and the European Union. As populations age, the burden of current fiscal policy is increasingly borne by younger people in the population. In most countries, economists computing generational accounts have found that people age 40 or below will pay more in taxes than they receive in transfer payments, while those age 60 or above will receive more in transfers than they pay in taxes. The differences are huge. According to a recent study by Jagadeesh Gokhale, summarized in the table below, in 2004 in the United States, a male age 30 could expect to pay $201,300 more than he receives in government transfers during his lifetime, while another male age 75 could expect to receive $171,100 more in transfers than he paid in taxes during his lifetime. That is a difference of $372,400! For future generations, those born after the year 2004, the difference is even more staggering. A male born after the year 2005 can expect to pay $332,200 more in taxes than he will receive in transfer payments. For a woman, the differences are also large but not as great. A woman age 30 in 2004 could expect to pay $30,200 more in taxes than she will receive in transfers during her lifetime, while a woman age 75 could expect to receive transfers of $184,100 in excess of her lifetime tax burden. The table below gives generational accounting estimates for the United States for the year 2004 for males and females. Figures shown are in thousands of 2004 dollars. Notice that the net burden on females is much lower than for males. That is because women live longer than men and thus receive Social Security and Medicare benefits over a longer period of time. Women also have lower labor force participation rates and earn less than men, and pay lower taxes as a result. Generational accounting has its critics—for example, the table above only measures direct taxes and transfers but omits benefits from government spending on public goods and services. In addition, government spending programs can be modified, which would alter the impact on future generations. Nonetheless, it does help to focus attention on the sustainability of current fiscal policies. Can future generations pay for Social Security, Medicare, and other retirement and health care spending as currently configured? Should they be asked to do so? Source: Jagadeesh Gokhale, “Generational Accounting,” The New Palgrave Dictionary of Economics Online, 2nd ed., 2008. A budget surplus leads to a decline in national debt; a budget deficit causes the national debt to grow. If there is a decrease in a budget surplus, national debt still declines but by less than it would have had the surplus not gotten smaller. If there is a decrease in the budget deficit, the national debt still grows, but by less than it would have if the deficit had not gotten smaller. Explain how the various kinds of lags influence the effectiveness of discretionary fiscal policy. Explain and illustrate graphically how crowding out (and its reverse) influences the impact of expansionary or contractionary fiscal policy. Discuss the controversy concerning which types of fiscal policies to use, including the arguments from supply-side economics. The discussion in the previous section about the use of fiscal policy to close gaps suggests that economies can be easily stabilized by government actions to shift the aggregate demand curve. However, as we discovered with monetary policy in the previous chapter, government attempts at stabilization are fraught with difficulties. Discretionary fiscal policy is subject to the same lags that we discussed for monetary policy. It takes some time for policy makers to realize that a recessionary or an inflationary gap exists—the recognition lag. Recognition lags stem largely from the difficulty of collecting economic data in a timely and accurate fashion. The current recession was not identified until October 2008, when the Business Cycle Dating Committee of the National Bureau of Economic Research announced that it had begun in December 2007. Then, more time elapses before a fiscal policy, such as a change in government purchases or a change in taxes, is agreed to and put into effect—the implementation lag. Finally, still more time goes by before the policy has its full effect on aggregate demand—the impact lag. Changes in fiscal policy are likely to involve a particularly long implementation lag. A tax cut was proposed to presidential candidate John F. Kennedy in 1960 as a means of ending the recession that year. He recommended it to Congress in 1962. It was not passed until 1964, three years after the recession had ended. Some economists have concluded that the long implementation lag for discretionary fiscal policy makes this stabilization tool ineffective. Fortunately, automatic stabilizers respond automatically to changes in the economy. They thus avoid not only the implementation lag but also the recognition lag. The implementation lag results partly from the nature of bureaucracy itself. The CBO estimate that only a portion of the spending for the stimulus plan passed in 2009 will be spent in the next two years is an example of the implementation lag. Government spending requires bureaucratic approval of that spending. For example, a portion of the stimulus plan must go through the Department of Energy. One division of the department focuses on approving loan guarantees for energy-saving industrial projects. It was created early in 2007 as part of another effort to stimulate economic activity. A Minnesota company, Sage Electrochromics, has developed a process for producing windows that can be darkened or lightened on demand to reduce energy use in buildings. Sage applied two years ago for a guarantee on a loan of $66 million to build a plant that would employ 250 workers. Its application has not been approved. In fact, the loan approval division, which will be crucial for projects in the stimulus plan, has never approved any application made to it in its two years in existence! Energy Secretary Steven Chu, a Nobel Prize-winning physicist, recognizes the urgency of the problem. In an interview with the Wall Street Journal, Dr. Chu said that his agency would have to do better. “Otherwise, it’s just going to be a bust,” he said.Stephen Power and Neil King, Jr., “Next Challenge on Stimulus: Spending All That Money,” Wall Street Journal, February 13, 2009, p. A1. Because an expansionary fiscal policy either increases government spending or reduces revenues, it increases the government budget deficit or reduces the surplus. A contractionary policy is likely to reduce a deficit or increase a surplus. In either case, fiscal policy thus affects the bond market. Our analysis of monetary policy showed that developments in the bond market can affect investment and net exports. We shall find in this section that the same is true for fiscal policy. Figure 12.10 "An Expansionary Fiscal Policy and Crowding Out" shows the impact of an expansionary fiscal policy: an increase in government purchases. The increase in government purchases increases the deficit or reduces the surplus. In either case, the Treasury will sell more bonds than it would have otherwise, shifting the supply curve for bonds to the right in Panel (a). That reduces the price of bonds, raising the interest rate. The increase in the interest rate reduces the quantity of private investment demanded. The higher interest rate increases the demand for and reduces the supply of dollars in the foreign exchange market, raising the exchange rate in Panel (b). A higher exchange rate reduces net exports. Panel (c) shows the effects of all these changes on the aggregate demand curve. Before the change in government purchases, the economy is in equilibrium at a real GDP of Y1, determined by the intersection of AD1 and the short-run aggregate supply curve. The increase in government expenditures would shift the curve outward to AD2 if there were no adverse impact on investment and net exports. But the reduction in investment and net exports partially offsets this increase. Taking the reduction in investment and net exports into account means that the aggregate demand curve shifts only to AD3. The tendency for an expansionary fiscal policy to reduce other components of aggregate demand is called crowding outThe tendency for an expansionary fiscal policy to reduce other components of aggregate demand.. In the short run, this policy leads to an increase in real GDP to Y2 and a higher price level, P2. In Panel (a), increased government purchases are financed through the sale of bonds, lowering their price to Pb2. 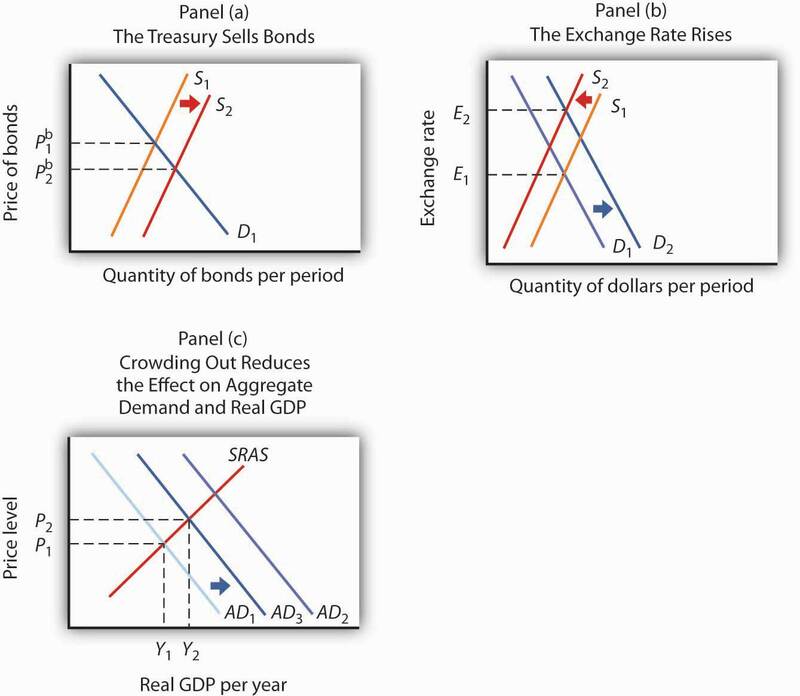 In Panel (b), the higher interest rate causes the exchange rate to rise, reducing net exports. Increased government purchases would shift the aggregate demand curve to AD2 in Panel (c) if there were no crowding out. 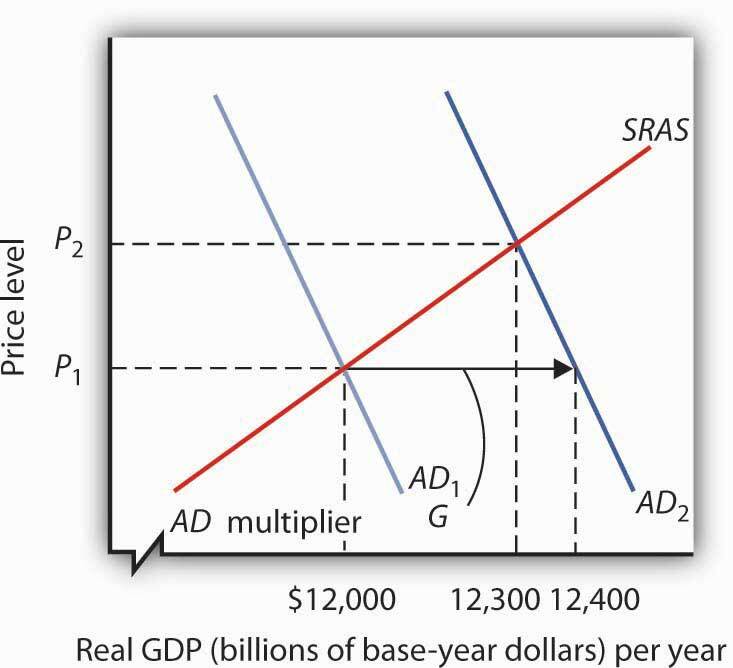 Crowding out of investment and net exports, however, causes the aggregate demand curve to shift only to AD3. Then a higher price level means that GDP rises only to Y2. Crowding out reduces the effectiveness of any expansionary fiscal policy, whether it be an increase in government purchases, an increase in transfer payments, or a reduction in income taxes. Each of these policies increases the deficit and thus increases government borrowing. The supply of bonds increases, interest rates rise, investment falls, the exchange rate rises, and net exports fall. Note, however, that it is private investment that is crowded out. The expansionary fiscal policy could take the form of an increase in the investment component of government purchases. As we have learned, some government purchases are for goods, such as office supplies, and services. But the government can also purchase investment items, such as roads and schools. In that case, government investment may be crowding out private investment. Crowding out and crowding in clearly weaken the impact of fiscal policy. An expansionary fiscal policy has less punch; a contractionary policy puts less of a damper on economic activity. Some economists argue that these forces are so powerful that a change in fiscal policy will have no effect on aggregate demand. Because empirical studies have been inconclusive, the extent of crowding out (and its reverse) remains a very controversial area of study. Also, the fact that government deficits today may reduce the capital stock that would otherwise be available to future generations does not imply that such deficits are wrong. If, for example, the deficits are used to finance public sector investment, then the reduction in private capital provided to the future is offset by the increased provision of public sector capital. Future generations may have fewer office buildings but more schools. Suppose Congress and the president agree that something needs to be done to close a recessionary gap. We have learned that fiscal policies that increase government purchases, reduce taxes, or increase transfer payments—or do a combination of these—all have the potential, theoretically, to raise real GDP. The government must decide which kind of fiscal policy to employ. Because the decision makers who determine fiscal policy are all elected politicians, the choice among the policy options available is an intensely political matter, often reflecting the ideology of the politicians. For example, those who believe that government is too big would argue for tax cuts to close recessionary gaps and for spending cuts to close inflationary gaps. Those who believe that the private sector has failed to provide adequately a host of services that would benefit society, such as better education or public transportation systems, tend to advocate increases in government purchases to close recessionary gaps and tax increases to close inflationary gaps. Another area of contention comes from those who believe that fiscal policy should be constructed primarily so as to promote long-term growth. Supply-side economicsThe school of thought that promotes the use of fiscal policy to stimulate long-run aggregate supply. is the school of thought that promotes the use of fiscal policy to stimulate long-run aggregate supply. Supply-side economists advocate reducing tax rates in order to encourage people to work more or more individuals to work and providing investment tax credits to stimulate capital formation. While there is considerable debate over how strong the supply-side effects are in relation to the demand-side effects, such considerations may affect the choice of policies. Supply-siders tend to favor tax cuts over increases in government purchases or increases in transfer payments. President Reagan advocated tax cuts in 1981 on the basis of their supply-side effects. Coupled with increased defense spending in the early 1980s, fiscal policy under Mr. Reagan clearly stimulated aggregate demand by increasing both consumption and investment. Falling inflation and accelerated growth are signs that supply-side factors may also have been at work during that period. President George W. Bush’s chief economic adviser, N. Gregory Mankiw, argued that the Bush tax cuts would encourage economic growth, a supply-side argument. Mr. Bush’s next chief economic adviser, Ben Bernanke, who became the next chairman of the Federal Reserve Board in 2006, made a similar argument and urged that the Bush tax cuts be made permanent. Finally, even when there is agreement to stimulate the economy, say through increasing government expenditures on highways, the how question remains. How should the expenditures be allocated? Specifically, which states should the highways run through? Each member of Congress has a political stake in the outcome. These types of considerations make the implementation lag particularly long for fiscal policy. Discretionary fiscal policy involves the same kind of lags as monetary policy. However, the implementation lag in fiscal policy is likely to be more pronounced, while the impact lag is likely to be less pronounced. Expansionary fiscal policy may result in the crowding out of private investment and net exports, reducing the impact of the policy. Similarly, contractionary policy may “crowd in” additional investment and net exports, reducing the contractionary impact of the policy. Supply-side economics stresses the use of fiscal policy to stimulate economic growth. Advocates of supply-side economics generally favor tax cuts to stimulate economic growth. Do the following hypothetical situations tend to enhance or make more difficult the use of fiscal policy as a stabilization tool? In an intriguing study, economist Baotai Wang examined the degree of crowding out of Canadian private investment as a result of government expenditures from 1961–2000. What made Professor Wang’s analysis unusual was that he divided Canadian government expenditures into five categories: expenditures for health and education, expenditures for capital and infrastructure, expenditures for the protection of persons and property (which included defense spending), expenditures for debt services, and expenditures for government and social services. Mr. Wang found that only government expenditures for capital and infrastructure crowded out private investment. While these expenditures reduced private investment, they represented increased public sector investment for things such as highways and ports. Expenditures for health and education actually “crowded in” private sector investment. These expenditures, Mr. Wang argued, represented increases in human capital. Such increases complement returns on private sector investment and therefore increase it. Mr. Wang found that Canadian government expenditures for debt service, the protection of persons and property, and for government and social services had no effect on private sector investment. He argued that expenditures for protection of persons and property may involve some crowding out, but that they also stimulated private investment by firms winning government contracts for defense purchases. The same explanation could be applied to government expenditures for government and social services. These also include an element of investment in human capital. His results suggest that crowding out depends on the nature of spending done by the government. Some kinds of spending clearly did not crowd out private sector investment in Canada. Source: Baotai Wang, “Effects of Government Expenditure on Private Investment: Canadian Empirical Evidence,” Empirical Economics 30, no. 2 (September 2005): 493–504. Data on the economy that are more accurate and more speedily available should enhance the use of fiscal policy by reducing the length of the recognition lag. If private sector investment does not respond much to interest rate changes, then there will be less crowding out when expansionary policies are undertaken. That is, the rising interest rates that accompany expansionary fiscal policy will not reduce investment spending much, making the shift in the aggregate demand curve to the right greater than it would be otherwise. Also, the use of contractionary fiscal policy would be more effective, since the fall in interest rates would “invite in” less investment spending, making the shift in the aggregate demand curve to the left greater than it would otherwise be. Large supply-side effects enhance the impact of tax cuts. 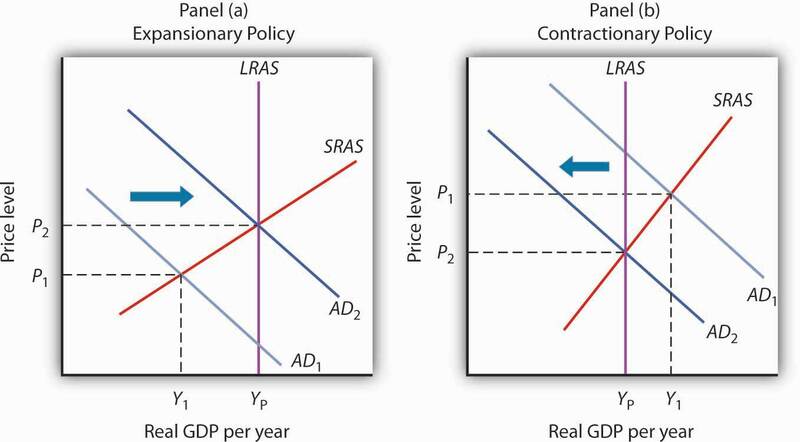 For a given expansionary policy, without the supply-side effects, GDP would advance only to the point where the aggregate demand curve intersects the short-run aggregate supply curve. With the supply-side effects, both the short-run and long-run aggregate supply curves shift to the right. The intersection of the AD curve with the now increased short-run aggregate supply curve will be farther to the right than it would have been in the absence of the supply-side effects. The potential level of real GDP will also increase.